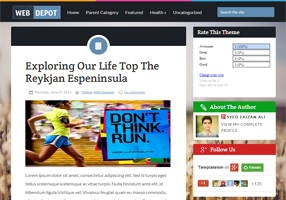 WebDepot is a combination of different color schemes which makes it look unique. This theme is ideal for Designing, web developing, and Magazine based website especially for those who stress more towards designing niche. Unlike our other themes, this has a lot of matchless features including some CSS3 inclusion and other significant functions. When you talk about pure designing, this template is almost invisible because we have used a lot of features for the first time. It has clean and sleek design and has a lot of gutsy utilities.